This public workshop is for the portion of the Bob Jones Trail connecting Los Osos Valley Road to the Octagon Barn. 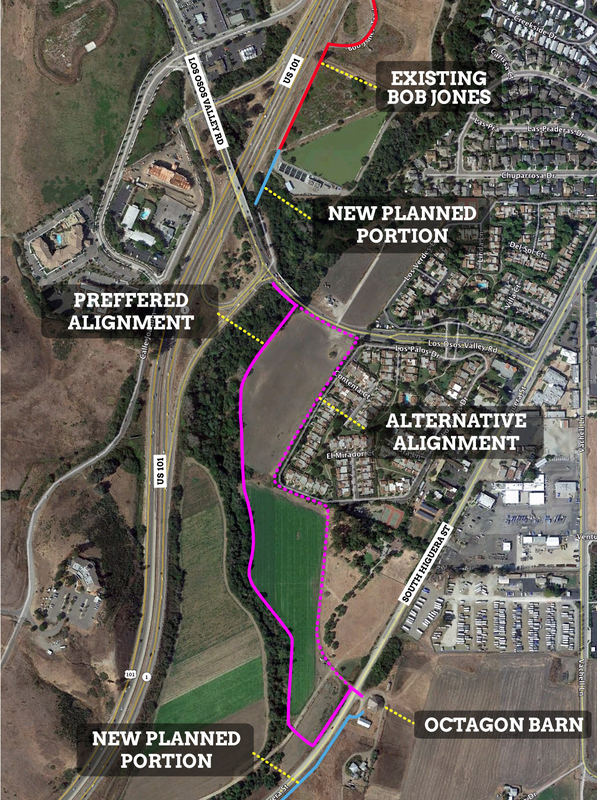 Join us at this important meeting to voice your support for a safe alignment of the Bob Jones Trail and an under-crossing of Los Osos Valley Road. • Voice your support for a safe and accessible alignment of the Bob Jones Trail! Visit bobjonestrailconnection.com for more information on this segment of the project. Why does an under-crossing matter? Imagine you and your family out for a ride on the Bob Jones. Little Jimmy is having a blast trying to identify the neighboring green hills. Sally is practicing her bicycle riding skills and wheelies. Mom decides to stop the group for a snack break of fruit and crackers. The best part is – you haven’t even left SLO yet! Everyone jumps back on their bicycles and continue to ride when suddenly, you find yourself riding slightly uphill to the Los Osos Valley Road overpass, expected to navigate as pedestrians across four lanes of 45 mph traffic and one of the busiest off-ramps in SLO County – in order to connect to the rest of the trail. The Bicycle Coalition wants a future where the Bob Jones Trail safely crosses under Los Osos Valley Road. Your voice is important at this community workshop to show your support for a safe under-crossing of Los Osos Valley Road for the Bob Jones Trail.